Corks will be popping after a Cotswolds antiques auction next week – when a large collection of vintage wines will go under the hammer. The sale at Moore Allen & Innocent in Cirencester on Friday, November 19 features enough wine, port and champagne to stock an empty cellar, and prices range from supermarket to superstar, with some bottles expected to make hundreds of pounds each. Among the best are four 12-bottle cases of the renowned red wine Chateau Haut-Brion Premier Grand Cru, from the 2007 vintage. Each case is expected to make £2,000. The three half cases of Chateau Laville Haut-Brion 2007, meanwhile, should make in the region of £1,500 a case – the six bottle-cases contain much rarer white wine from the estate. 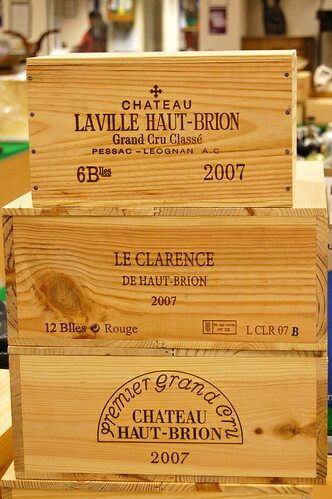 Returning to the reds, three 12-bottle cases of Le Clarence De Haut-Brion 2007 are expected to achieve around £500 a case, and four individual bottles of Chateau Laurivet Haut-Brion 1987 should make £50 a bottle, while a single bottle of Chateau Le Pape Leognan 1955 is expected to achieve between £100 and £150. One tipple you wouldn’t usually expect to see in great quantities is 1963 port. Connoisseurs consider the vintage a classic, and much of it remains in private collections. Moore Allen will be selling 65 bottles of 1963 Fonseca, to be sold mainly in batches of six, with each bottle expected to achieve £100 to £150. The port section also includes five bottles of Fonseca 1966 (£50 to £100 each), seven bottles of Grahams 1975 vintage (£20 to £30 each) and two bottles of Sandeman 1934, at £100 to £150 each.